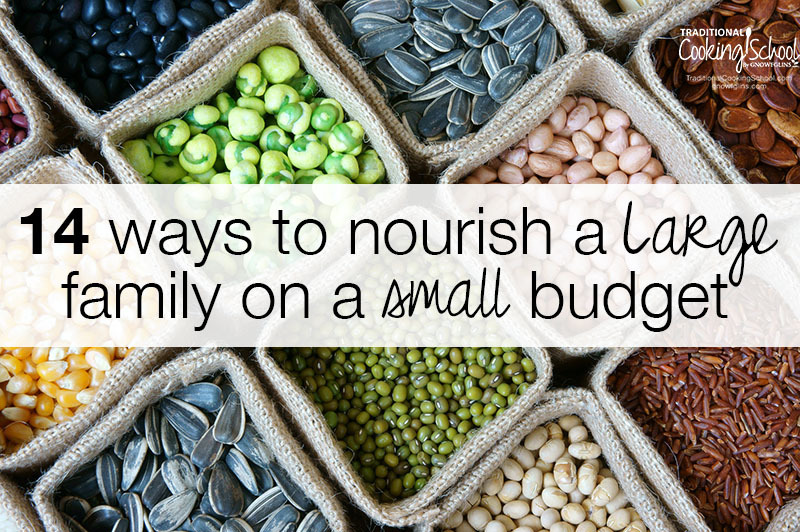 Got a large family… and a small food budget? Yet, due to your high standards for nutrition, you shudder at the thought of filling hungry tummies with cheap, non-nutritious filler foods? You're not alone! And there's hope. 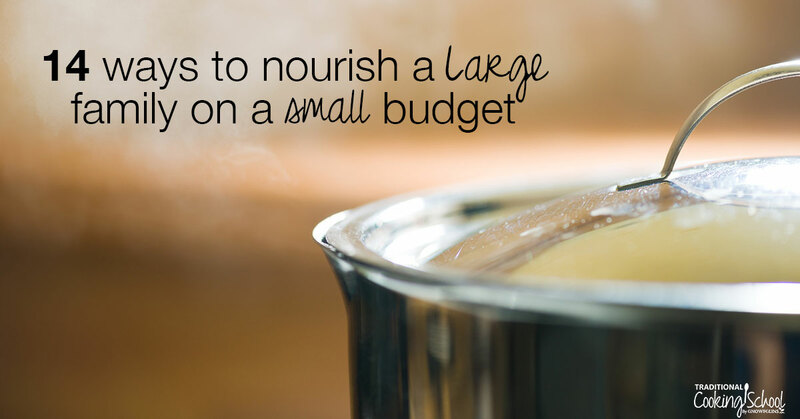 In the past, I shared 8 general tips to rein in your real food budget. Those do apply to large families, too, but they're more general. 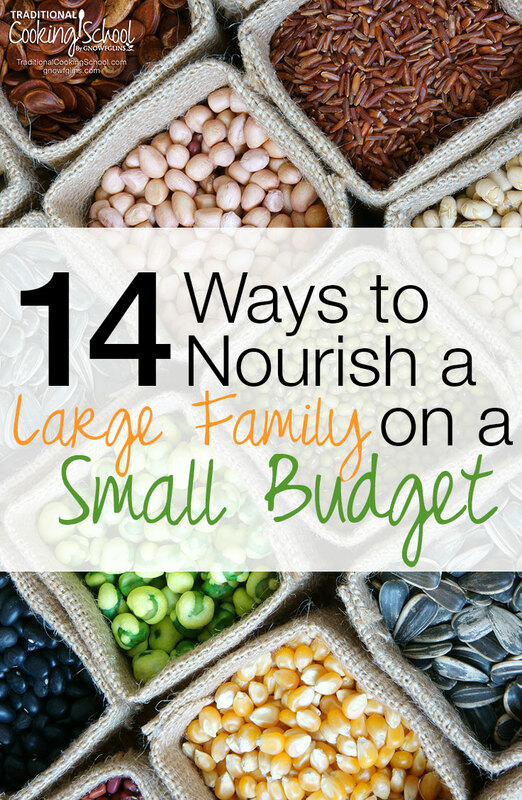 Yet I felt it was high time I shared more ways that larger families can nourish their families with a small food budget. Be sure to share your tips or reactions in the comments! Like these tips? Share the infographic image at right on Facebook, Pinterest, or Twitter, or by email! Hover over the image and easy share buttons will appear! 1. Stick to a menu plan! Plan out EVERYTHING: meals, sides, snacks, desserts, school lunches, meals for potlucks during the week, and snacks for kids' activities. Then make a detailed shopping list and stick to it. This will be work up front, yet then you'll have a written plan for your family's entire week, and you won't be scratching your head wondering what you're going to make for dinner on Wednesday afternoon at 4:30 pm. Because you have a plan, you'll avoid last-minute runs to the store (which cost time and money) and caving in to eating out (which also costs time and money)! Having a meal plan and sticking to it is essential for any family — and especially one on a budget! If you're a large family, it makes so much sense (and cents!) to buy items in bulk. With food buying clubs like Azure Standard and UNFI, membership stores like Sam's and Costco, and online vendors like Amazon, Radiant Life, and Wilderness Family Naturals, bulk-buying has never been easier or more convenient. Consider grass-fed beef. Depending on your location, you might pay anywhere from $6 to $10 per pound (or maybe more!). You'll get a much lower price per pound — $4 to $7 per pound, most likely — plus varying cuts of meat if you do a bulk purchase of a quarter or half cow from a local rancher. Membership stores like Costco (and even Sam's) are carrying more and more natural and organic items, including produce, healthy fats like coconut and avocado oils, and nuts. Check out my friend Katie's post, What Does a Real Foodie Buy at Costco?, to learn what Real Food items you can find for your family's budget. If food co-ops or bulk-buying clubs don't exist in your area, you can start your own co-op or learn how to find one near you. 3. Invest in proper kitchen tools. But trust me on this, having the proper kitchen equipment to store, prepare, and cook your family's meals will save you money and sanity! You can't make large batches of anything without the right size stock pots and baking pans. Consider how much easier your life might be if you had more than 1 slow cooker. One for perpetual stock and one for the roast you're serving for dinner. Or better yet, get an Instant Pot because it will do slow-cooking, pressure cooking, and more — this 8 quart is a perfect size for a large family. And if you're going to be purchasing perishable items in bulk, a second fridge and/or freezer is essential. Please don't rush out to the nearest department store and buy these items brand-new! Check thrift stores, garage sales, and Craigslist to find like-new items at significantly reduced prices. 4. Bulk up meals with frugal, whole foods. By soaking or sprouting your beans, rice, oats, and other grains, you are unlocking tons of frugal nutrition. You can add beans to soups, chili, pasta sauce, and even make dessert with them without sacrificing taste. Check out the Everything Beans eCookbook for loads of ideas to nourish your family with beans! Rice is an excellent source of nutrition, especially when soaked or sprouted, and when added to beans to form a complete protein. Granola, granola bars, cookies, and a bowl of hearty oatmeal utilize inexpensive oats. Add-ins like nuts, shredded coconut, or dried fruits are completely optional. A little can be added for flavor at minimal cost, depending on your budget. Potatoes and sweet potatoes are another nourishing, yet frugal, way to bulk up your meals. Add a healthy fat, like butter, to your potatoes to keep blood sugars stable and increase nutrition. In-season produce is always less expensive than out-of-season produce. For example, buy cucumbers and tomatoes in the summer and not the winter when they are transported thousands of miles and not as flavorful anyway. Cruciferous veggies, such as broccoli and cauliflower, will be cheaper during cooler months — when they naturally grow — than in summer when they must be transported from cooler regions. Apples are better in September than they are in January, and less expensive, too. Enjoy berries in the spring and early summer instead of in late fall and early winter. You'll pay less per pound for in-season produce, and you'll get better flavor and more nutrition. 6. Grow your own produce. A small packet of seeds will likely cost you $1 to $3, yet you can get a huge return on your investment when you harvest produce or herbs you've grown yourself! And you don't have to live on acreage to do this! This is a great learning experience for little ones and a fulfilling family project. You don't need much space either! A few pots on a porch or balcony, a small raised bed or two in the backyard, or even a windowsill herb garden are excellent ways to grow your own food and save money. 1 or 2 zucchini plants in pots on your porch will produce enough fruit to keep an entire family in zucchini for a whole growing season. If you have the space on your property, try planting a fruit tree or two. Just make sure to choose a variety that will grow well in your area and keep it fertilized with compost. Landscape your yard with edibles instead of ornamental plants. Practical and beautiful! Besides fruit trees, lovely choices for edible landscaping include creeping herbs like thyme for ground cover, blueberries or blackberries to add bushiness and height, and pole beans or cucumbers for trellises. Check out our gardening articles or the book The Edible Front Yard: The Mow-Less, Grow More Plan For A Bountiful Garden. Fermentation adds nutrition without much cost. Cabbage is one of the most inexpensive foods you can buy (or grow), yet lacto-fermenting it into sauerkraut increases the taste and nutrition. Don't care for sauerkraut? Ferment something else! Choose which foods you'll ferment based upon what produce is on sale at the store, what's in season, or what you're already growing. The least expensive veggies at the store often make the tastiest ferments — like carrots, radishes, beets, and green beans! Plus, fermentation is an amazing way to preserve food that might otherwise go to waste! Learn all you need to know about lacto-fermentation in our Lacto-Fermentation eCourse or Lacto-Fermentation eBook or grab my FREE Fermenting Formulas Cheat Sheet. Meat, produce, and baked goods are the items that tend to spoil first. If you buy meat in bulk, you'll definitely need an extra freezer to store it long-term. If you buy your meats as-needed on a weekly or monthly basis, refrigerate the meat you plan to use within a few days and freeze the rest. Serve produce that tends to spoil quickly (such as lettuce, spinach, and bananas) first, and save longer-lasting potatoes, onions, and carrots for later meals. When you bake, refrigerate any leftover breads or muffins (especially moist baked goods) within 2 days to prevent spoilage or mold growth. Even scraps can be used! Vegetable peels can be added to broth for flavor and a mineral boost. Other veggie waste, like cauliflower or broccoli stems, can be fed to dogs and chickens, or composted. Putting all your scraps to work for you in some way is an excellent way to stretch your dollars! 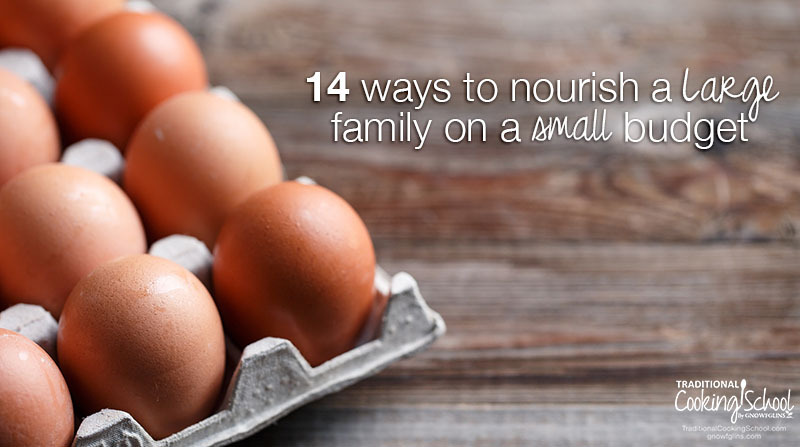 Eggs are a frugal, but nourishing source of protein and fat-soluble vitamins. Protein is important, but it's also the most expensive component of any meal. Buy the best eggs you can afford and trust that your family is getting lots of nutrition from frugal meals like quiche or scrambled eggs. 10. Save $$ — ditch processed foods. Even if it's a special occasion. Money spent on these items is money that can be redirected and spent on more nutrient-dense foods for your family. Help your family transition to healthy “soda” in the form of water kefir or kombucha (continuous brew is especially frugal!) or any of these other gut-healthy fermented drinks. No matter what you can buy in a box or package at the store, I guarantee you can make it for less at home — especially if you have a large family. Crackers? Yes! I teach you how to make the most amazing crackers ever in our Sourdough eCourse or Sourdough A to Z eBook. Yogurt? Yep! It's one of the easiest and fastest ways to cut your budget. I show you how in our Cultured Dairy & Basic Cheese eCourse or Cultured Dairy & Basic Cheese eBook. Cereal? Here are 31 Deliciously Nourishing Granola Recipes! Bottom line: No matter what size your family is, you'll increase nutrition and decrease the grocery budget just by switching from processed to homemade items. 11. Make your own yogurt. If you can't afford or find raw milk, use store milk to make homemade yogurt or kefir instead of drinking it. That's right — you don't have to wait to make homemade yogurt, kefir, or other cultured dairy products until you have raw milk! Even though pasteurized milk is a dead food, you bring it back to life when you culture it into yogurt or kefr! And it brings nourishment to your family for less than raw milk and less than the store-bought versions of these same products. I show you how to make your own cultured dairy in our Cultured Dairy & Basic Cheese eCourse or Cultured Dairy & Basic Cheese eBook. With this one, simple staple, you can create all the baked goods your family will ever need and never have to buy muffins, tortillas, crackers, or loaves of bread again! 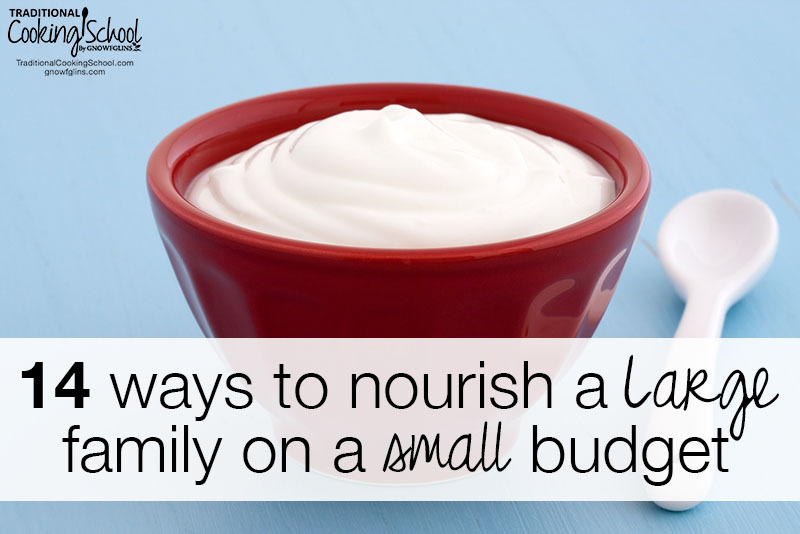 This is one tip I recommend for saving money AND filling hungry tummies with nourishing foods. Making all these baked goods doesn't have to rule your life, either. To quickly begin saving money, choose the item you buy most often from the store — such as bread — and learn how to make that with your sourdough starter first. As time allows, you will slowly replace the other store-bought items with your homemade versions! Don't want to commit to an eCourse or eBook yet? Grab your free downloads — “How To Start A Sourdough Starter” and “No-Knead Artisan Sourdough Einkorn Bread“! Did you plant a garden and now have zucchini or tomatoes coming out your ears? Find a steal of a deal on berries at the grocery store? Want to store bulk meat purchases but can't afford a second fridge or freezer? Guess what? All of these items can be preserved through dehydration! So you don't have to throw away any of your garden's bounty, you don't have to pass up the opportunity to stock up on something at the store for a great price, and you don't have to put off a bulk purchase of meat! Dehydrating saves money AND space — and is an excellent way to feed a large family on a small budget. Learn how to dehydrate veggies, fruits, and meat in our Dehydrating eCourse or Dehydrating eBook. If affording healthy, nourishing foods for your family means you have to increase your budget, but that has seemed impossible before, it's time to think outside the box! With a little creativity, it is likely that you can find a few extra dollars for your food budget, if you're willing to make some sacrifices in other areas of your life. Check out this post for more creative ways to stretch your food budget! Like these tips? Share this infographic image on Facebook, Pinterest, or Twitter, or by email! Hover over the image and easy share buttons will appear! 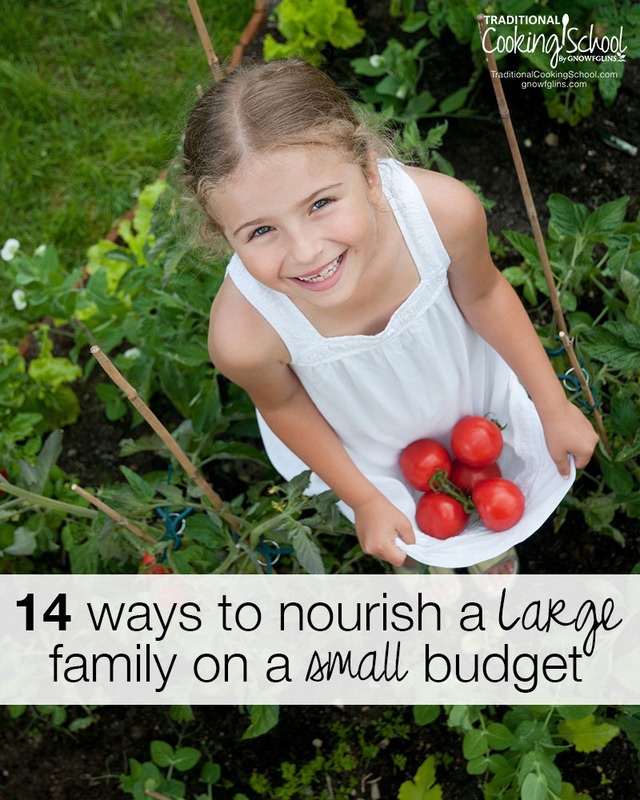 Are you striving to nourish your large family on a small budget? Please share how you do it in the comments! We have a few crock pots too, but that roaster is much appreciated and used! (We are a family of 10, soon to be 11). What kind of roaster do you use? I have gone through 2 electric ones so far because it’s rusting from continous bone broth. 🙁 Thanks! I also want to add a tip about farmers markets and SNAP benefits (food stamps). Some farmers markets accept food stamps, and some even have a matching program. My local market (opening again tomorrow, yay!) is open three times a week and each day you go, they will match the first $10 in food stamps you use. This means that as long as you save some of your food stamps (don’t spend them all at the grocery store), you can get up to $30 free at the farmers market each week. We are blessed where I live in the CT River valley to have lots of farmers markets and I could get the matching program at two different markets one year (they closed down one market last year due to manager burnout). I just wanted to let people know about that. Also, my local co-op gives free one-year memberships to food stamp recipients as well as reduced price perpetual memberships, giving them 10% off everything in the store, food or not. Each year, it is easy to renew, too. So if you are on food stamps, ask at each of your good food stores if they have programs you can participate in. Yes, yes, and yes, except – don’t refrigerate your bread! It goes bad FASTER in the fridge. I always share this tip with people: Shop at an “ethnic market”. In the city I just moved from, bell peppers were $1.89 each at the SaveMart grocery store (those were non-organic!). The Mexican market 2 blocks down had bell peppers for 85 cents each! It wasn’t just the bell peppers–all the produce was cheaper, and much of it was organic. Go on Google and look for a Mexican, Indian, or Asian market in your town. I haven’t noticed much a difference in buying seasonal produce vs off-season vs u-pick. Also, any farmer’s market I’ve ever been to is outrageously expensive–I’d save more by shopping at Whole Foods! Who the heck pays $10 for 12 small ears of corn?! Another thing to ask yourself is where you can cut expenses outside of the kitchen. Does a stay-at-home mom who is at home most of the day with internet access readily available on a computer really need an iPhone with a data plan? Does her husband need a data plan when he’s at a computer all day for work? Hang your own laundry. I did this, even in an apartment with no balcony or yard. I hung everything on hangers from the shower curtain rod, as well as a couple drying racks in the bedroom near the window. In the winter, wear slippers and sweaters and sleep with a hot water bottle in your bed instead of cranking up the heat. In summer, drink ice water and spritz yourself with water from a spray bottle to cool off instead of running the air conditioner all day. Use candles or oil lamps at night. Stop buying foil, sandwich baggies, and saran wrap and use glass food storage containers with lids to store food. Stop buying paper towels and napkins and use cotton versions. Use meat as a side dish. Yes, it’s important for B12 and other nutrients, but we really don’t each need 6 oz every night. Minimize your pantry. Do you really need butter AND olive oil AND coconut oil AND ghee AND tallow AND…? Or can you just buy butter and olive oil? Look on Craigslist for raw milk, pastured eggs, etc. I found a farmer that sells raw milk for $5 a gallon, vs $9 a gallon at the store. Walk or bike everywhere you can and drive as little as possible. Just a few tips to save money. I used to have to stretch $12,000 a year to feed 3 people and we ate quite well on such a small budget. It can be tough feeding a larger family when you have kids with gut problems. A few of my seven children do not eat grains or are limited and cannot eat eggs or dairy. They are often hungry. I no longer bake because of this and that was one of the ways I filled them up before. We eat a lot of orange vegetables like carrots, sweet potato and butternut squash. This year we grew butternut squash and had a bumper crop. Those went into cold storage and we may not have to buy it all winter. I love my Instant Pots; I have 2. I make a large batch of brown rice on Sundays and a pot of beans, too. Today I will make bean and bacon soup from the white beans I made for the week for lunches. Stews and soups help stretch meat. Still, my very active daughter struggles to feel full after eating since she cannot eat grains. It’s tough to keep up with her caloric needs. As part of steps #3,#5, & #13 I would add home canning. It is so economical compared to buying so many things at the store. Plus, you control exactly what goes in it. When you garden, a great way to save is to can it all yourself. Then the price is your time and effort, plus the canning lid (& the jar the first time round). Or even freeze dry. There are home freeze dryers available and if you save up they are a great way to save leftovers, your garden gems, and bulk buys. They use space differently than a freezer; so you don’t have to have one large space but can find several smaller spaces to store your food. Under the bed, in the closet, or other nooks and crannies in the house when you don’t have extra room for a freezer.